Last week, one of the most breathtakingly unlikely hoaxes started taking in gullible Facebook users. Did you hear? Costco would give you a $1,000 gift card for free just because you’re on Facebook! All you had to do (depending on the version of the scam the user saw) was to click on “Like” on a certain link, leave a comment or fill out a survey – or some combination of all three! It’s quite simply astonishing the number of people who believe these hoaxes. First, the link a user had to follow was a dead giveaway: a “blogspot” link. Having “blogspot” as part of a URL means the site is a blog that is being hosted by Google’s Blogger service. There’s nothing wrong with that at all, per se, if you’re an everyday blogger like me. But, if you’re a huge company like Costco, you won’t be using a free blogging website as the main source of hosting all the information on your supposed “free giveaway.” You’ll definitely be using your own website due to security and legitimacy concerns. Now, let’s look at this rationally. If Costco (or Tim Hortons or whoever) is really going to be giving away gift cards to “everyone” on Facebook, you need to keep in mind that there are about 800 million Facebook users. If Costco were to give away $1,000 gift cards to everyone on Facebook, that means they would be giving away $800 billion (that’s billion, folks) in “free” stuff to people. If you ran a company that gave away $800 billion in merchandise all at once during your busiest sales period (Christmas), you wouldn’t be in business for long. And if you were an investor in a company that was giving away $800 billion at Christmas instead of trying to make $800 billion at Christmas, I’d start downgrading your retirement plans from winters in Florida to winters living in an old refrigerator box beneath a bridge. Unless you want a quick way to go bankrupt, no company is going to “promise” to give away “free” $1,000 (no less!) gift cards “just” for being on Facebook. The silliness of this just too much to believe, but – as with every scam out there – people fall for it every time. Facebook users would make the experience a lot better if they stopped hoaxes in their tracks! Unless a gift card is being promoted by a company’s Facebook page itself, then it’s almost certainly a hoax. Like I’ve said 100 times before, stop the insanity! Please do your part for stopping Facebook hoaxes and other scams such as e-mail chain letters, etc. Constantly spreading online hoaxes is a real credibility killer. If you’ve never heard of the term “sketchy Santas” before, it’s become a commonly used term for really bad Santa Claus photos. First, check out Sketchy Santas. 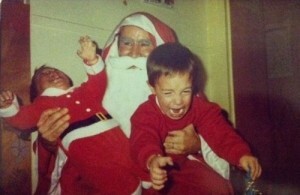 This simply designed website highlights very awkward photos of children with Santa Claus. They seem to fall into one of these common streams: Santa looks really drunk or mean; Santa’s hand is (hopefully innocently) placed in a very inappropriate place; or the child couldn’t have been more terrified had Satan ascended from hell and showed up at the front door. More sketchy Santas and other hilarious Christmas “fails” can be found at Failblog.org’s holiday-related site found here. at . Warning: some content is inappropriate for minors. According to British tabloid The Sun, actor Charlie Sheen had to change his cell phone number recently after mistakenly posting it as a public message for his nearly 5.6 million Twitter followers to see. The tabloid reported that Sheen was apparently trying to send a direct message (commonly known as DM) to Canadian teen pop star Justin Bieber, asking him to call him on his cell. Instead of sending Bieber a DM, he mistakenly posted it to his main Twitter feed through his cell phone’s Twitter app. Needless to say, Sheen had to change his number. Thank goodness “The Biebs” didn’t turn around and retweet it to his 15.4 million followers, too!